A few years ago, author Marie Kondo’s book, The Life-Changing Magic of Tidying Up, became a New York Times Bestseller. Kondo, a Japanese consultant who helps people get organized, detailed her KonMari method of decluttering in her book. We wondered if her principles could be applied to writing and found that they work just as well for creating clean copy as they do for creating a clean habitat. Here are some great tips inspired by Kondo’s book to help you declutter your writing and make it come to life. It’s hard to figure out where to start editing when you look at your writing as a whole, but if you break it down into categories things become a whole lot easier. Kondo’s book will help you clear out a cluttered closet and find a new home for that blender you never use. In writing, instead of taking out the garbage, you’ll be sweeping away the extra verbiage. Finding incidences of some of the words below might be as simple as using your word processor’s “find” feature (ctrl + F or cmd + F), sorting through your finds, and deciding what to dump. Weasel words are qualifiers. They can make your position seem weak or ambiguous, as though you’re trying to create a little wiggle room. Say what you mean! Slash words like: could, can, like, may, might, virtually, up to, as much as, believe, and possibly. You may need a qualifier every now and again, but more often than not you’ll find yourself able to cut them without changing the meaning of what you’ve written. In fact, your writing will be stronger and you’ll sound more confident. How will you know you’ve used a weasel word? If you sound like a politician trying to smooth over a public relations disaster, you’re on the right track. Renowned newspaper editor William Allen White said, “If you feel the urge of ‘very’ coming on, just write the word, ‘damn,’ in the place of ‘very.’ The editor will strike out the word, ‘damn,’ and you will have a good sentence.” Editors disdain the words very and really, so it only stands to reason that you should pitch them out when you’re cleaning up your draft. You may find you have a tendency to use adverbs to amplify weak adjectives. Instead of saying that death metal concert was “really loud” you could say it was “ear-splitting.” That good-looking salesman may be “very cool,” but why not describe him as “suave” instead? Better yet, especially if you’re writing fiction, do your best to eliminate adjectives that tell readers how to feel. Invoke feelings through narrative, instead. Before: Not a soul wandered the dark, deserted streets that night. After: Not a soul wandered the streets that night. Kondo is onto something when she directs her readers to focus on specific categories one at a time. The practice allows you to detach from your writing project as a whole and home in on the specific bits that need tidying up. It also encourages you to be ruthless with your purging. Remember: less is more! We tend to ramble when we’re writing; it’s our brain’s way of finding just the right words. It’s fine to pour those words out into your first draft, but once the draft is finished, it’s time to start cleaning house. To declutter your living space, Kondo recommends putting all your clothing (or books) on the floor so you can get a clear look at just how much you have and get rid of whatever’s unnecessary. You can apply the same principle to your writing. Dump everything into your draft, but then sort through it, category by category, and keep only what works. 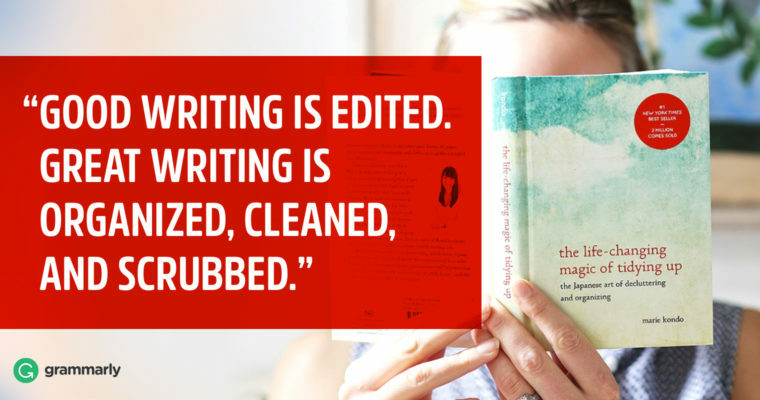 Cleaning up your writing, just like cleaning up your home, is a process. It takes time to develop the habits that keep clutter at bay. But, as you tidy up each draft, you’ll begin to learn how to avoid most of the messiness in the first place. When you come across weasel words, empty words, and redundancies, you’ll be able to leave them on the shelf, and your writing will bring you joy.